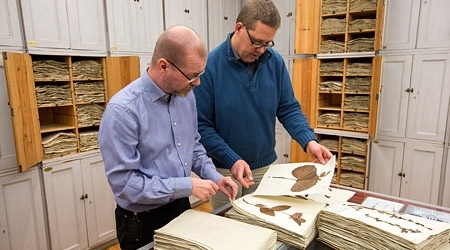 Stefan Ekman and Mats Hjertson at the Museum of Evolution are happy to finally be able to make parts of the Thunberg collection available to the world. In stiff competition the Uppsala Museum of Evolution has been granted funding for digitising the Japanese parts of the Thunberg collection. The project will make the valuable plants available to the whole world, online. It will soon be 350 years since Linnaeus's disciple Carl Thunberg travelled with the Dutch East India Company to Japan, via South Africa, Sri Lanka and Java. In total he collected almost 28,000 plants on his journey, of which 731 were from Japan. “They represent to a large extent the first description of Japanese plants”, says Mats Hjertson, curator at Uppsala University’s Museum of Evolution. The pressed plants are kept in their original sheets of paper, in a specially built room at the Museum of Evolution. Sadly inaccessible to most researchers, since no samples are lent out. Vinnova, which is the Swedish Governmental Agency for Innovation Systems, and JSPS – the Japan Society for the Promotion of Science – have now chosen to fund the museum’s project to carefully document and digitise the Japanese plants. The collection consists to a large part of so called type specimens which connect species with their names. But the names used today can differ somewhat from the names decided on by Carl Thunberg towards the end of the 18th century. “What will happen is that Japanese systematists will come here to study all the Japanese specimens from a modern taxonomic viewpoint. At the same time we will scan them to get high quality digital images”, says Stefan Ekman, first curator of the Museum of Evolution. All the data will then be published in an open database online, available to the whole world. Previously, anyone who has wanted to study the plants in the collection have had to travel to Uppsala to view them on location, or ask the museum to send lower resolution images taken with a digital camera. “It is still relatively expensive for Japanese researchers to come here, so this will simplify things tremendously”, says Stefan Ekman. “It is also a question of democracy. You will no longer need the financial backing of a department, you could just as well be a competent amateur”, says Mats Hjertson. The Museum of Evolution’s project is one of three that have been granted funding by Vinnova and JSPS, out of 14 applicants. The project will be carried out together with the National Museum of Nature and Science in Japan, beginning in September 2013. The long-term goal is to digitise the whole Thunberg collection.